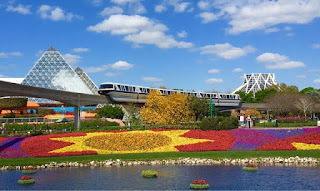 One of the highlights of a the Flower and Garden Festival is the thousands of flowers that are added to the grassy areas on the way into World Showcase. They really add to this shot I took today of Future World West. You can see Journey into Imagination, The Land, as well as a monorail in this photo. Looks like a postcard! Beautiful!! !